Preheat oven to180 degrees Celsius. Place muffin cases in the muffin tin. Combine carrots, oil, sugar, egg and pineapple and mix . Mix the dry ingredients together in a separate bowl and slowly add. Fill muffin cases ¾ full and finish with light sprinkling of brown sugar. Bake for 12 minutes or until a knife comes out clean. When cooled add cream cheese drizzle, if desired. Whip cream cheese in bowl using electric beaters. Slowly add confectioner’s sugar and vanilla. 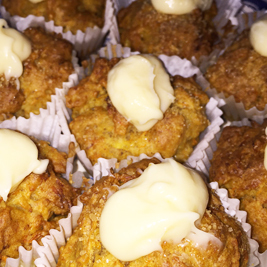 Drizzle over muffins when they are cooled. Keep the drizzle small. Want to know more about eating for IBS? Take one of our programmes. Looking for more delicious FODMAP recipes? Take a look at this delicious index.